With the list feature, you can create check lists and to do lists for your project and structure project information in a very early stage of your project, without having to create tasks or a timed project plan. You can only create project-related lists, i.e. lists that belong to an InLoox project. Open the project to which you want to add a new list. 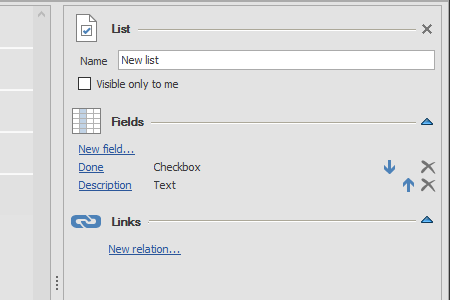 In the project, on the Start tab, click on Lists in the Ribbon. On the Edit tab, click on New list. In the side panel on the right, you can name your list. If you want to create a personal check list with your own to-dos, then activate the Visible only to me checkbox. When you have activated the checkbox, other team members aren't able to see this check list. Click on New field to add more fields to your list and name them however you like. Use the arrows to change the order of the fields in your list, use the cross to delete a field from your list. With a click on the regarding link, you can navigate directly to the corresponding element in the project, e.g. to the mind map node the list belongs to. Now, add more entries to your list. Click on the Edit tab on New entry. You can type the text directly in the list into the line. 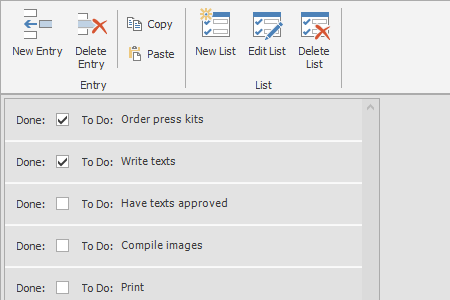 Create a classic check list to tick boxes with the field types checkbox and text. Create a list with dates with the field types date and text. 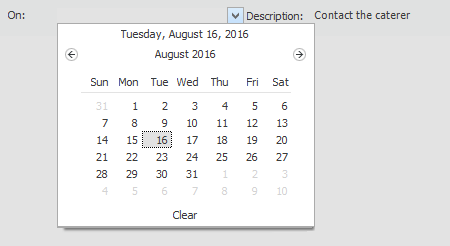 Click on the little arrow in the date area of the list to select a date for each list entry. On the View tab, you can change between a card an a list view. These views only have an impact on what your list looks like, they do not alter the content. On the tabs on the bottom left, you see all lists that have already been added to your project. You can add as many lists to your project as you like and navigate from list to list there. 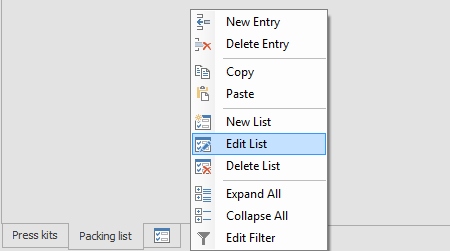 Click on the right mouse button to open a context menu with which you can create new lists and edit or delete existing lists. In the Ribbon, on the Edit tab, click Edit list to also change the list you are currently on. How to create a new to-do list | InLoox 9 for Outlook • Copyright 1999-2019 © InLoox, Inc. All rights reserved.